United Airlines has drawn fierce criticism after it mishandled passengers’ pets in three separate incidents in March. In March 17-18 poll, 25% said they would choose a longer, more expensive American Airlines flight over United. That is less than the 44 percent who said the same in April 2017 after scandal over passenger’s forcible removal from plane. United Continental Holdings Inc.’s popularity, which had been on its way to recovery after a passenger was dragged off one of its planes in April last year, took another dive this month after a United passenger’s 10-month-old French bulldog died in an overhead bin and the airline made mistakes in shipping two other pets last week. But Morning Consult Brand Intelligence shows that the 28-point plunge in net favorability, while steep, is not as dramatic as the slide United saw in April 2017 after a passenger was dragged off a plane. The data also show U.S. adults are less likely to abandon the airline for its competitors than they were after last year’s scandal. 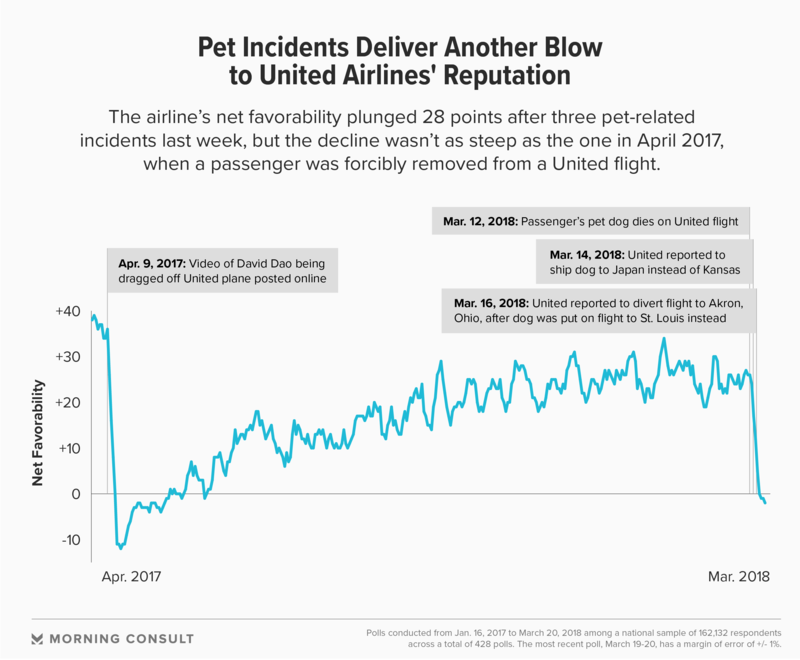 As of Tuesday, the airline’s net favorability had dropped to minus–2 from plus-26 on March 12, when a United flight attendant insisted that a passenger place a carrier containing a pet dog in the overhead bin. The dog died by the end of the flight. United apologized and said the attendant did not hear the passenger or understand that a dog was in the carrier. The incident was compounded further, when a day later, the airline mistakenly sent a family’s Kansas-bound German shepherd to Japan. Then on March 15, United was forced to divert a flight because a dog heading to Akron, Ohio, was mistakenly placed on a plane to St. Louis. Reports of these two events emerged a day after they occurred. Since the start of the pet-related incidents, negative buzz about the company leaped 23 points, with 40 percent of people surveyed by Morning Consult Brand Intelligence on Tuesday saying the coverage they saw about the company was negative. Morning Consult Brand Intelligence has surveyed 162,132 respondents about United Airlines across 428 polls from Jan. 16, 2017, to March 20. The most recent survey, March 19-20, has a margin of error of 1 percentage point. But the public’s outrage during this scandal is less severe than the 47-point drop in net favorability United experienced in the eight days after David Dao was dragged off a United flight on April 9, 2017, when he refused to give up his seat to airline employees. Videos of the scuffle between Dao and Chicago aviation security officers were posted online the same day, and negative buzz for the airline spiked from 12 to 56 points within a week. For more than a month afterward, majorities of people said what they’d seen or heard about the company had been negative. A Morning Consult poll conducted April 12, 2017, found 44 percent of those who had heard about the incident also said they would sacrifice both money and time to avoid flying with United. But after the pet-related scandal, 25 percent of 854 adults in a subsample of a separate Morning Consult poll conducted March 17-18 said the same thing. The subsample in the March poll has a margin of error of 3 percentage points, and the April 2017 poll has a margin of error of 2 percentage points. The public backlash after the pet incidents is less drastic because not all passengers are pet owners, while anyone can feel sympathy for another human, and the video made it easier to share on TV and social media networks, said Derek D. Rucker, a marketing professor at the Kellogg School of Management at Northwestern University, during a March 20 phone interview. Rucker said he doesn’t doubt that the French bulldog’s death was a result of miscommunication, but United’s recent history has put it under a microscope. “When your reputation starts to dip, every other action you take is scrutinized differently,” he said. United flew the most animals in cargo of any U.S. airline last year, according to the Transportation Department, but of the 24 pets that died during air transport in 2017, 18 were on United flights. The airline also had the highest number of incidents per 10,000 animals transported, which includes injury or loss, at 2.2, against an industry average of 0.79. Last week’s developments prompted Sens. John Kennedy (R-La.) and Catherine Cortez Masto (D-Nev.) to introduce a bill March 15 to prohibit airlines from storing animals in overhead compartments. Ira Kalb, a University of Southern California professor who studies branding and image creation, said March 19 by phone that in the most recent scandal, United has so far followed the three steps of crisis management: admit and apologize, limit the scope and propose a solution to prevent the issue from occurring again. Morning Consult data showed that United’s favorability stabilized last year, but Kalb said the airline needs to step up training of employees because consumers have likely begun to doubt that the airline’s problems are isolated. United has temporarily suspended its PetSafe program for transporting animals that are not eligible to travel in the aircraft cabin and said it will complete a review of the program by May. “Have we made mistakes? Of course. And we know this,” United spokesman Charlie Hobart said March 20 by phone. That is one of the reasons why United is temporarily shutting down the PetSafe program and looking for ways to improve, he said.